Is the Looting Really Over? 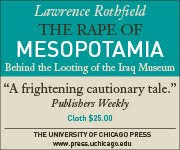 Martin Bailey strikes again, with an interview with Dr Abbas al-Husseini, described as "the leading archaeologist in Iraq," who tells readers of the Art Newspaper that "looting is over". Bailey's new piece is a followup on an article earlier this summer that as he notes "generated considerable controversy" because it suggested that no post-2003 looting had occurred. Though the article spins Abbas' comments as corroborating this view, at least now the Art Newspaper has admitted that some looting went on after 2003. The position now is that, in Abbas' words, looting did occur post-2003, though it "declined very considerably in 2004 and has diminished yet more since then." Paul Barford, fellow SAFEcorner blogger, is right to see this as cognitive progress of sorts. Still, the overall message to readers is: relax, looting is no longer a problem, since "professional looting has ended." But there is reason to treat Dr Abbas' claims, as reported by Mr Bailey, with some skepticism. For one thing, Dr Abbas is not by any stretch of the imagination Iraq's "leading archaeologist". Originally trained as an historian, he is a Shia evangelist and supporter of Muqtada al Sadr's Mahdi movement. After Sadr's party was given control of the ministry in which SBAH was housed and Donny George was forced to flee the country, Abbas was appointed President of the State Board of Antiquities and Heritage despite his lack of archaeological qualifications. Ousted after a year, he moved to London on a scholarship to study archaeology, but returned to Baghdad this summer in hopes of regaining his post if, as expected, the SBAH is moved this fall from the Ministry of Tourism and Antiquities back to the Ministry of Culture. With the assassination this past week of Kamil Shia, the last secular high official at the Ministry of Culture, that ministry is now dominated by Islamists, brightening the job prospects for Dr Abbas. It is hardly surprising that someone in Dr Abbas' position might lean toward painting the rosiest possible picture, one in which the Iraqi government has matters totally under control, looks strong and independent, and has no need of outside help: "Guards with proper facilities are protecting sites," and Iraqi archaeologists have resumed excavating, which means the sites are better monitored. But there are thousands of sites, and very few digs. And we know from published reports that the site police have been hamstrung by shortages of equipment, gas, weaponry, and helicopters. The statement that looting declined severely in 2004 can be disproven by satellite images that compare the situation in 2003 and 2004 with images from 2006, 2007, and 2008. There is no question that there were greatly increased looting on hundreds of sites between 2003 and 2008, including the sites of Isin (near Diwaniyah), Fara, and Adab in Qadissiyah province. Continuing destruction to sites in Dhi Qar and Muthanna provinces, south of Qadissiyah, can also be documented by images from 2006-2008... In the past few months, the Oriental Institute bought new images of several sites, including Umma and Zabalam. The increase of looting at these sites is greater than it was in the images of 2006. Now, it is true that we do not know for certain what the degree or rate of looting has been for the entirety of the country. To determine that we would need to be able to compare, year by year, the satellite or aerial imagery for at least a representative sample of sites. Unfortunately, purchasing these images on the market would be prohibitively expensive; for just two sets of imagery for the single small site analyzed by Hritz, the cost was over $7000. As I have noted elsewhere, the US military undoubtedly possesses these images and could share them with researchers. Why the images are not being shared is a question that an enterprising reporter should be asking Pentagon or State Department officials.